Hyperion is delighted to present the world’s best-loved cello concerto performed by one of the world’s best-loved cellists: national treasure Steven Isserlis. 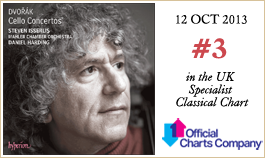 Isserlis has waited 40 years to record this pinnacle of the repertoire, and here with his regular collaborators, the Mahler Chamber Orchestra and Daniel Harding, this long gestation has proved to be overwhelmingly fruitful. 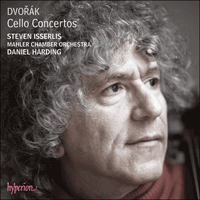 Isserlis writes of the concerto that ‘the power of its emotional journey, expressed with Dvořák’s characteristically folk-like simplicity and directness, offers an irresistible mix of the epic and the touchingly confessional’. The combination of emotional power and simplicity is also a feature of Isserlis’s playing, and part of what makes him such a consummate performer of this work. This album puts Dvořák’s B minor cello concerto in context, including not only the original ending, but an orchestral version of the song Lasst mich allein which is quoted in the concerto’s second and third movements. The birth of the world’s most beloved cello concerto came as something of a shock to its father. On 10 December 1894 Dvořák wrote to his friend Alois Göbl: ‘I have actually finished the first movement of a Concerto for violoncello!! Don’t be surprised about this, I too am amazed and surprised enough that I was so determined on such work.’ In fact, the concerto was almost written for the piano or violin, for both of which Dvořák had already written concertos. According to his son Otakar, Dvořák disliked the cello, ‘since it sounded too much like muttering’; he felt that it was heard to best advantage in the orchestra and in chamber music rather than as a solo instrument. (It is curious how otherwise intelligent men can be so deluded at times.) For the concerto’s eventual instrumentation we have to thank the insistent Czech cellist who inspired and even collaborated on the work’s composition, Hanuš Wihan (1855–1920). But we also have to be grateful to three rather disparate and unexpected sources of musical inspiration: a glorious series of waterfalls; an Irish-American writer of musical comedies; and an ailing Czech Countess. Dvořák spent most of the time between late 1892 and early 1895 in America, teaching at the newly formed National Conservatory of Music in New York. In 1893, on his way back to New York after a blissful summer spent among the Czech community in Spillville, Iowa, he visited Niagara Falls. It was reported that Dvořák, having stood for five minutes as though hypnotized, exclaimed: ‘Lord God, this will become a symphony in B minor.’ (Thirty-five years later, Maurice Ravel visited the Falls, and is said to have announced: ‘Quel majestueux si bémol!’—‘What a majestic B flat!’. Was this drop of a semitone an early symptom of global warming?) Dvořák’s epiphany did not result in a symphony (his final work in that genre, the Symphony No 9 in E minor, ‘From the New World’, was pretty much complete by that point); but the grandeur, heroism and nobility of the Cello Concerto in B minor could perhaps stem from that pivotal moment. Some months later, Dvořák’s ideas about the failings of the cello as a solo instrument were challenged when he attended a concert in which the Irish-American cellist and composer Victor Herbert, better known for musical comedies such as Babes in Toyland, performed his own second Cello Concerto. Here was a lyrical work in which the cello sang out over the orchestra; Herbert described how Dvořák embraced him after the performance, insisting with characteristically loud-voiced enthusiasm that the concerto was ‘famos! famos!—ganz famos!’. And then, once he had embarked on his own concerto, Dvořák’s inspiration was intensified in a poignant way when he learned of the illness of his sister-in-law Josefina, the Countess Kounic, back in Bohemia. Dvořák, like several composers before him (Mozart and Haydn among them), had been in love with his wife’s sister before settling on his wife Anna. Indeed, his feelings may not have changed that much over the years; his great-grandson, ‘Tony’ Dvořák, reported in the 1990s that the family were still gossiping about the relationship. Be that as it may, Josefina’s fate was to have a strong effect on this concerto. Nevertheless, Dvořák intended that the premiere of the concerto, to take place in London on 19 March 1896, would be given by Wihan. In the event, though, Wihan was otherwise engaged on that date; and Dvořák, having at first protested to the impresario (‘I am sorry to announce you that I cannot conduct the performance of the celo conzerto. The reason is I have promised to my friend Wihan—he will play it’), accepted an English cellist, Leo Stern. Stern was also engaged for the Prague premiere some three weeks later. One imagines that Wihan must have been chewing his carpet, especially since he had already given a private performance of the concerto with Dvořák at the piano some months before; but Stern seems to have done everything in his power to please Dvořák—including trying to learn Czech, and even sending Dvořák some rare pigeons (pigeons being, along with trains, boats and beer, among the composer’s abiding passions). And so Stern won out, probably through sheer determination (how little the music world has changed! ); and Wihan had to wait until 1899 for his sole performance of the concerto under the composer’s baton, in Budapest. About the concerto itself, little need be said; the power of its emotional journey, expressed with Dvořák’s characteristically folk-like simplicity and directness, sweeps aside all description. The orchestral writing, with particularly prominent parts for solo flute and clarinet, is as commanding as that in Dvořák’s symphonies. From the portentous opening, through the magical appearance of the second subject in the horn (from about 2'13''), the cello’s heroic entry in B major (at 3'31''), the thrilling start of the recapitulation with a soaring transformation of the second subject (11'12''), to its triumphant ending, the first movement offers an irresistible mix of the epic and the touchingly confessional. In the G major second movement one can surely feel Dvořák’s homesickness for his beloved Bohemia. Nostalgia and a love of nature seem to frame every note, particularly in the gentle opening theme, and in the birdsong we hear in the accompanied cadenza (from 7'20'') that adorns the return of the first section. It is in this movement, too, that we feel Josefina’s presence most strongly: in the central minore section Dvořák quotes from a song of his own that Josefina had always loved—Lasst mich allein (Leave me alone), Op 82 No 1 (from 2'50''). The finale is a large-scale rondo blessed, as the programme note for the first performance put it, with a ‘well-nigh embarrassing plenitude of subject matter’. Well, perhaps not embarrassing; but certainly Dvořák conjures theme after theme of ravishing beauty—including a third subject in the slow movement’s pastoral key of G major (at 5'59'') imbued with a sense of home-coming that, had the concerto remained in its original form, would have impelled the work towards a joyous conclusion. The end of the concerto was to undergo a transformation, however. A month after Dvořák returned to Bohemia, Josefina died; and in her memory he extended the final coda with reminiscences from both the first and second movements—including another quotation from her beloved song, this time played by a solo violin, along with flute and clarinets (track 3, at 10'45''). Even in retrospect, this alters the overall impression of the concerto; a work that might have come across as largely celebratory is layered with a sense of farewell. It is interesting to compare this coda with another deeply moving end to a cello concerto, that by Elgar. With the latter, one can feel that the coda is an essential part of the overall plan; with Dvořák’s one is perhaps aware that it is an afterthought—but it is none the less heart-rending for that. For interest’s sake, we offer here the (surprisingly abrupt) original ending of the concerto, as it was before Josefina died—see track 5. Also, in order that the song Lasst mich allein, quoted in the concerto’s second and third movements, may be heard in a version closer to its original form, we present it here (track 4) in an orchestral arrangement that I was lucky enough to find some years ago in a catalogue of antique music. The words of the song, in which the singer begs to be left alone with her dreams, are touchingly apt. La naissance du concerto pour violoncelle le plus apprécié au monde fut une sorte de choc pour celui qui lui avait donné le jour. Le 10 décembre 1894, Dvořák écrivait à son ami Alois Göbl: «J’ai vraiment terminé le premier mouvement d’un concerto pour violoncelle!! N’en soyez pas surpris, je suis moi-même assez stupéfait et étonné d’avoir composé une telle œuvre avec autant de détermination.» En fait, le concerto était pratiquement écrit pour le piano ou pour le violon, deux instruments pour lesquels Dvořák avait déjà composé des concertos. Selon son fils Otakar, Dvořák n’aimait pas le violoncelle, «car il sonnait trop comme des grommellements»; il trouvait que l’instrument se montrait sous un jour plus avantageux à l’orchestre et en formation de musique de chambre qu’en soliste. (Il est curieux que des hommes par ailleurs intelligents puissent parfois se tromper à ce point.) L’instrumentation finale du concerto doit beaucoup à l’insistance du violoncelliste tchèque, Hanuš Wihan (1855–1920), qui a inspiré la composition de cette œuvre et y a même collaboré. Mais trois sources d’inspiration musicale assez disparates et inattendues méritent aussi notre reconnaissance: une magnifique série de chutes d’eau; un auteur de comédies musicales américain d’origine irlandaise; et une comtesse tchèque souffrante. Entre la fin de l’année 1892 et le début de l’année 1895, Dvořák passa la majeure partie de son temps en Amérique à enseigner au Conservatoire national de musique fondé depuis peu à New York. En 1893, sur le chemin du retour à New York après un délicieux été passé dans la communauté tchèque de Spillville, dans l’Iowa, il se rendit aux Chutes du Niagara. Il paraît qu’après y être resté comme hypnotisé pendant cinq minutes, Dvořák s’exclama: «Seigneur Dieu, ça deviendra une symphonie en si mineur.» (Trente-cinq ans plus tard, Maurice Ravel, devant les Chutes du Niagara, passe pour avoir dit: «Quel majestueux si bémol!». Cet abaissement d’un demi-ton était-il un symptôme anticipé de réchauffement planétaire?) La révélation de Dvořák ne donna pas lieu à une symphonie (sa dernière œuvre dans ce genre, la Symphonie nº 9 en mi mineur «du Nouveau Monde», était presque terminée à ce moment-là); mais la majesté, l’héroïsme et la noblesse du Concerto pour violoncelle en si mineur proviennent peut-être de ce moment crucial. Quelques mois plus tard, les idées de Dvořák sur les défauts du violoncelle comme instrument soliste furent remises en cause à l’occasion d’un concert où le violoncelliste et compositeur américain d’origine irlandaise Victor Herbert, surtout connu pour des comédies musicales comme Babes in Toyland, joua son propre Concerto pour violoncelle nº 2. C’était une œuvre lyrique où le violoncelle chantait fort au-dessus de l’orchestre; Herbert décrivit la manière dont Dvořák l’embrassa après l’exécution, affirmant avec insistance et un enthousiasme très exubérant, comme à son habitude, que le concerto était «famos! famos!—ganz famos!». Ensuite, lorsqu’il se lança dans son propre concerto, l’inspiration de Dvořák se renforça de manière poignante quand il apprit la maladie de sa belle-sœur Josefina, la comtesse Kounic, de retour en Bohême. Comme plusieurs compositeurs avant lui (notamment Mozart et Haydn), Dvořák avait été amoureux de la sœur de sa femme avant de choisir sa propre femme Anna. En fait, ses sentiments n’avaient peut-être pas tellement changé au fil des ans; son arrière-petit-fils, «Tony» Dvořák, a raconté dans les années 1990 que la famille cancanait encore à propos de ces relations. Quoi qu’il en soit, la mort de Josefina allait avoir beaucoup d’effet sur ce concerto. Néanmoins, Dvořák voulait que la création du concerto, qui devait avoir lieu à Londres, le 19 mars 1896, soit donnée par Wihan. Mais, en l’occurrence, Wihan avait d’autres engagements à cette date et Dvořák commença par protester auprès de l’imprésario («J’ai le regret de vous annoncer que je ne peux diriger l’exécution du concerto pour violoncelle. La raison en est que j’ai promis à mon ami Wihan—qu’il le jouerait»). Mais il finit par accepter un violoncelliste anglais, Leo Stern. Stern fut aussi engagé pour la première exécution à Prague environ trois semaines plus tard. On imagine que Wihan dut ronchonner, d’autant plus qu’il avait déjà donné une exécution privée du concerto avec Dvořák au piano quelques mois auparavant; mais Stern semble avoir fait tout ce qui était en son pouvoir pour plaire à Dvořák—il essaya notamment d’apprendre le tchèque et envoya même à Dvořák des pigeons rares (les pigeons comptant, avec les trains, les bateaux et la bière, parmi les passions durables du compositeur). Et Stern l’a ainsi emporté, sans doute uniquement grâce à sa détermination (le monde de la musique a bien peu changé! ); Wihan dut attendre jusqu’en 1899 la seule et unique exécution de ce concerto qu’il ait donnée sous la direction du compositeur, à Budapest. À propos du concerto lui-même, il n’y a pas grand-chose à dire; la puissance de son parcours émotionnel, qui s’exprime avec cette simplicité et ce côté direct caractéristiques du langage populaire de Dvořák, écarte toute idée de description. L’écriture orchestrale, avec des solos de flûte et de clarinette particulièrement importants, est aussi imposante que dans les symphonies de Dvořák. Du début très grave à la fin triomphale en passant par l’apparition magique du second sujet confié au cor (à partir de 2'13'' environ), l’entrée héroïque du violoncelle en si majeur (à 3'31"), le début exaltant de la réexposition avec une transformation progressive du second sujet (11'12"), le premier mouvement offre un mélange irrésistible d’épopée et de confession touchante. Dans le deuxième mouvement en sol majeur, on sent certainement le mal du pays dont souffrait Dvořák à l’égard de sa chère Bohême. La nostalgie et l’amour de la nature semblent encadrer chaque note, en particulier dans le doux thème initial, ainsi que dans le chant des oiseaux que l’on entend au cours de la cadence accompagnée (à partir de 7'20") et qui orne le retour de la première section. C’est aussi dans ce mouvement que se fait ressentir le plus fortement la présence de Josefina: dans la section centrale minore, Dvořák cite une de ses propres mélodies que Josefina avait toujours aimée—Lasst mich allein, op.82 nº 1 (à partir de 2'50"). Le finale est un rondo à grande échelle doté, comme l’indique le programme de la création, d’un «sujet d’une plénitude presque embarrassante». Bon, peut-être pas embarrassante, mais Dvořák fait apparaître comme par magie, l’un après l’autre, des thèmes d’une ravissante beauté—notamment un troisième sujet dans la tonalité pastorale de sol majeur du mouvement lent (à 5'59") imprégné d’un parfum de retour à la maison qui, si le concerto était resté sous sa forme d’origine, aurait poussé l’œuvre vers une joyeuse conclusion. Toutefois, la fin du concerto allait subir une transformation. Un mois après le retour de Dvořák en Bohême, Josefina mourrait; et à sa mémoire, il prolongea la coda finale avec des réminiscences du premier comme du deuxième mouvement—notamment une autre citation de la mélodie qu’elle aimait tant, confiée cette fois à un solo de violon, sur un accompagnement de hautbois et de clarinettes (plage 3, à 10'45"). Même après coup, cela change l’impression d’ensemble du concerto; une œuvre qui aurait pu avoir un caractère largement festif se trouve teintée d’un sentiment d’adieu. Il est intéressant de comparer cette coda à une autre fin profondément émouvante d’un concerto pour violoncelle, celui d’Elgar. Dans ce dernier, on sent que la coda est une part essentielle du plan général de l’œuvre; dans celui de Dvořák, on peut avoir l’impression qu’il s’agit d’une pensée après coup—mais elle n’en est pas moins déchirante. Pour l’intérêt général, nous proposons ici la fin originale (incroyablement abrupte) du concerto, telle qu’elle était avant la mort de Josefina—voir plage 5. En outre, afin que la mélodie Lasst mich allein, citée dans le deuxième et le troisième mouvements du concerto, puisse être entendue dans une version plus proche de sa forme originale, nous la présentons ici (plage 4) dans un arrangement orchestral que j’ai eu la chance de trouver il y a quelques années dans un catalogue de musique ancienne. Les paroles de la mélodie, où la chanteuse demande à rester seule avec ses rêves, correspondent de façon touchante à la réalité. En 1975, l’éminent spécialiste de Dvorák Jarmil Burghauser a publié sa propre orchestration du Concerto en la majeur; cette édition suit de près l’original et mérite vraiment qu’on y prête attention. Mais presque cinquante ans plus tôt, le compositeur allemand Günter Raphael avait produit une version beaucoup plus libre, révisant le concerto comme il imaginait que Dvořák aurait pu le faire s’il était revenu sur cette œuvre; Raphael était un compositeur à succès, ses œuvres étant jouées par Furtwängler, parmi tant d’autres. Il a pris une approche audacieuse, reconnaissant lui-même avoir pratiquement réécrit le concerto de Dvořák. Sur le papier, ça semble curieux—une œuvre de jeunesse de Dvořák, réécrite par un moderniste du XXe siècle. Pourtant, à mon humble avis (mais un avis convaincu), cette version fonctionne beaucoup mieux sur le plan musical que l’original. Raphael conserve la chaleur et le charme du concerto, tout en le sculptant dans une forme maîtrisable. Bien sûr, ce n’est pas un chef-d’œuvre au niveau du Concerto en si mineur ultérieur; mais est-il juste de mettre sous le boisseau un enfant plus âgé uniquement parce que son plus jeune frère est un génie? J’aime le Concerto en la majeur pour la beauté de ses mélodies, pour la fraîcheur de son inspiration, pour son esprit typiquement traditionnel—et pour la joie pure qui pétille dans toute cette œuvre. Die Geburtsstunde des weltweit beliebtesten Cellokonzerts versetzte den Urheber in einen schockartigen Zustand. Am 10. Dezember 1894 schrieb Dvořák an seinen Freund Alois Göbl: „Ich habe tatsächlich den ersten Satz eines Konzerts für Violoncello fertiggestellt!! Wundere Dich nicht, ich bin auch verblüfft und überrascht, dass ich zu einem Werk so entschlossen war.“ Tatsächlich wäre das Konzert fast für Klavier oder Violine entstanden, für die Dvořák jeweils schon Solokonzerte geschrieben hatte. Seinem Sohn Otakar zufolge mochte Dvořák das Cello nicht, „da es zu brummend klang“; seiner Ansicht nach war der Einsatz des Cellos am vorteilhaftesten im Orchester und in der Kammermusik, und nicht so sehr als Solo-Instrument. (Es ist eigentümlich, wie ansonsten intelligente Menschen derart verblendet sein können.) Die letztendliche Instrumentierung haben wir dem beharrlichen tschechischen Cellisten Hanuš Wihan (1855–1920) zu verdanken, der Dvořák zu dem Konzert inspirierte und sogar zur Komposition des Werks beitrug. Doch waren noch drei weitere, grundverschiedene und unerwartete Inspirationsquellen jeweils auf ihre Weise am Gelingen des Cellokonzerts beteiligt: eine wundervolle Reihe von Wasserfällen, ein irisch-amerikanischer Autor musikalischer Komödien sowie eine kränkelnde tschechische Gräfin. Dvořák lebte von Ende 1892 bis Anfang 1895 hauptsächlich in Amerika, wo er an dem neugegründeten National Conservatory of Music in New York unterrichtete. 1893 besichtigte er die Niagarafälle nach einem herrlichen Sommer, den er in der tschechischen Gemeinde in Spillville (Iowa) verbracht hatte. Es wird berichtet, dass Dvořák nach mehreren Minuten, in denen er wie hypnotisiert dastand, ausrief: „Herrgott, das wird eine Symphonie in h-Moll.“ (35 Jahre später besichtigte Maurice Ravel die Wasserfälle und soll gesagt haben: „Quel majestueux si bémol!“—„Welch’ ein majestätisches B!“. War dieser Abstieg um einen Halbton ein verfrühtes Symptom der globalen Erderwärmung?) Dvořáks Erleuchtung wurde allerdings nicht in eine Symphonie umgesetzt (sein letztes Werk dieses Genres, die Symphonie Nr. 9 in e-Moll, „Aus der Neuen Welt“, war zu diesem Zeitpunkt mehr oder minder fertiggestellt), doch entstammt das Majestätische, das Heroische und das Noble seines Cellokonzerts in h-Moll möglicherweise diesem Schlüsselmoment. Einige Monate später wurden Dvořáks Begriffe bezüglich der Mängel des Cellos als Solo-Instrument infrage gestellt, als er ein Konzert besuchte, in dem der irisch-amerikanische Cellist und Komponist Victor Herbert, besser bekannt für musikalische Komödien wie etwa Babes in Toyland, sein eigenes zweites Cellokonzert aufführte. Es war dies ein lyrisches Werk, in dem das Cello über dem Orchester sang; Herbert beschrieb, wie Dvořák ihn nach der Aufführung umarmte und mit charakteristischer, stimmgewaltiger Begeisterung erklärte, dass das Konzert „famos! famos!—ganz famos!“ gewesen sei. Und als Dvořák dann mit seinem eigenen Konzert begann, intensivierte sich seine Inspiration in schmerzlicher Weise, als er von der Krankheit seiner Schwägerin Josefina, Gräfin Kounic, in Böhmen hörte. Wie mehrere Komponisten vor ihm (darunter Mozart und Haydn), hatte auch Dvořák sich zunächst in die Schwester seiner zukünftigen Ehefrau verliebt, bevor er dann Anna Cermáková heiratete. Möglicherweise hatten sich seine Gefühle über die Jahre nicht sonderlich gewandelt—sein Urenkel „Tony“ Dvořák berichtete noch in den 1990er Jahren von dem anhaltenden Familienklatsch über die Beziehung. Wie dem auch sei, Josefinas Schicksal sollte jedenfalls einen beträchtlichen Einfluss auf das Konzert haben. Trotzdem wollte Dvořák, dass die Uraufführung des Konzerts, die am 19. März 1896 in London stattfinden sollte, von Wihan gegeben würde. Als es jedoch soweit war, musste Wihan absagen, da er bereits anderweitig engagiert war. Dvořák hatte sich zunächst bei dem Impresario beschwert („Ich muss Ihnen leider mitteilen, dass ich die Aufführung des Cellokonzerts nicht dirigieren kann. Der Grund dafür ist, dass ich sie meinem Freund Wihan versprochen habe—er wird es spielen“), doch akzeptierte er dann einen englischen Cellisten, Leo Stern. Stern wurde ebenfalls für die Prager Premiere drei Wochen später engagiert. Wihan muss sich geärgert haben, insbesondere weil er bereits mehrere Monate zuvor eine Privataufführung des Konzerts mit Dvořák am Klavier gegeben hatte. Stern hingegen scheute keine Mühen, Dvořák zu schmeicheln—er bemühte sich sogar, Tschechisch zu lernen und schickte Dvořák mehrere seltene Tauben (neben Zügen, Schiffen und Bier gehörten Tauben zu den anhaltenden Leidenschaften des Komponisten). So setzte Stern sich durch, wahrscheinlich einfach durch Zielstrebigkeit (wie wenig sich die Musikwelt geändert hat! ), und Wihan musste bis 1899 warten, bis er seine einzige Aufführung des Konzerts unter der Leitung des Komponisten in Budapest geben konnte. Über das Konzert selbst muss nicht viel gesagt werden—die Kraft der emotionalen Reise, die mit Dvořáks charakteristischer, volksmusikartiger Schlichtheit und Direktheit ausgedrückt wird, fegt alle Beschreibungen beiseite. Der Orchestersatz, in dem sich besonders herausragende Partien für Soloflöte und Klarinette finden, ist ebenso anspruchsvoll wie diejenigen der Symphonien Dvořáks. Von dem unheilvollen Beginn, über das zauberhafte Erscheinen des zweiten Themas im Horn (ab etwa 2'13''), den heroischen Einsatz des Cellos in H-Dur (bei 3'31''), den spannenden Beginn der Reprise mit einer aufsteigenden Verwandlung des zweiten Themas (11'12''), bis hin zu dem triumphierenden Ende bietet der erste Satz eine unwiderstehliche Mischung des Epischen und des anrührend Bekenntnishaften. Im zweiten Satz, der in G-Dur steht, wird sicherlich Dvořáks Heimweh nach seinem geliebten Böhmen ausgedrückt. Nostalgie und Naturliebe scheinen sich in jedem Ton zu äußern, insbesondere in dem sanften Anfangsthema, und im Vogelgesang ist eine begleitete Kadenz (ab 7'20'') zu hören, die die Wiederkehr des ersten Teils verziert. In diesem Satz ist auch die Gegenwart Josefinas am deutlichsten zu spüren—im Mittelteil in Moll zitiert Dvořák ein Lied, das er selbst komponiert und das Josefina besonders geliebt hatte: Lasst mich allein, op. 82 Nr. 1 (ab 2'50''). Das Finale ist ein großangelegtes Rondo von einer „fast peinlichen Fülle von thematischem Material“, wie es im Programmtext der Uraufführung ausgedrückt war. Peinlich ist vielleicht das falsche Wort, doch gelingt es Dvořák sicherlich, ein wunderschönes Thema nach dem anderen zu zaubern, darunter auch ein drittes Thema in der Pastoraltonart G-Dur des langsamen Satzes (bei 5'59''), das von einer Heimkehr-Stimmung erfüllt ist, die das Werk zu einem freudigen Abschluss geführt hätte, wenn das Konzert seine ursprüngliche Form beibehalten hätte. Das Ende des Cellokonzerts sollte jedoch noch einmal abgewandelt werden. Einen Monat nachdem Dvořák nach Böhmen zurückgekehrt war, starb Josefina. Zum Andenken an sie dehnte er die letzte Coda mit Erinnerungen an sowohl den ersten als auch den zweiten Satz aus, einschließlich eines weiteren Zitats aus ihrem geliebten Lied, das diesmal von einer Solovioline zusammen mit Flöte und Klarinetten (Track 3, bei 10'45'') gespielt wird. Selbst im Nachhinein ändert dies den Gesamteindruck des Konzerts—ein Werk, das zunächst in erster Linie feierlich gewirkt haben könnte, ist nun von einer Atmosphäre des Abschieds überlagert. Es ist interessant, diese Coda mit dem Schluss des Cellokonzerts von Elgar, ebenfalls ein tiefergreifendes Werk, zu vergleichen. Bei Letzterem merkt man, dass die Coda ein wesentlicher Bestandteil der Gesamtanlage des Werks ist, bei Dvořák hingegen stellt sich möglicherweise eher der Eindruck ein, dass es sich um einen nachträglichen Einfall handelt; es ist deshalb aber nicht weniger herzerweichend. Interessehalber bieten wir hier den (überraschend abrupten) ursprünglichen Schluss des Konzerts, wie er stand, bevor Josefina starb—siehe Track 5. Auch das Lied, Lasst mich allein, das im zweiten und dritten Satz des Konzerts zitiert wird, präsentieren wir zusätzlich in einer Form, die dem Original näher kommt (Track 4), nämlich in einer Orchesterfassung, die ich durch einen glücklichen Zufall vor einigen Jahren in einem Katalog antiquarischer Noten aufgetan habe. Der Text des Liedes, in dem die Sängerin darum bittet, in ihren Träumen allein gelassen zu werden, ist sehr treffend und anrührend. Es ist seltsam, dass Dvořák nie darauf hingewiesen zu haben scheint, dass das Cellokonzert in h-Moll nicht seine erste Bemühung in dem Genre war. Dabei hatte er 1865, fast dreißig Jahre zuvor, ein Konzert in A-Dur für einen Cellisten-Kollegen des Orchesters des Regionaltheaters Prag (wo Dvořák mehrere Jahre als Bratschist tätig war), Ludevít Peer (1847–1904), geschrieben. (1865 war ein produktives Jahr für den jungen Komponisten, in dem er auch seine ersten beiden Symphonien und den Zyklus von Liebesliedern, Die Zypressen, der ebenfalls von seiner Liebe zu Josefina inspiriert war und den er später für Streichquartett arrangierte, komponiert hatte.) Dvořák kam nie dazu, das A-Dur-Konzert zu orchestrieren, und als Peer etwas später nach Deutschland zog, nahm er das Manuskript für Cello und Klavier mit. Dvorák muss wohl angenommen haben, dass es verloren gegangen sei, als es jedoch schließlich auftauchte—heute wird es in der British Library aufbewahrt—, war eine Veröffentlichung unabdingbar. Dvořák selbst sprach später von seiner „verrückten“ frühen Schaffensperiode, als er begann, seine eigene musikalische Stimme zu finden. Man kann daher wohl mit einiger Sicherheit annehmen, dass er das Konzert, wenn es ihm später in die Hände gefallen wäre, entweder vernichtet oder stark überarbeitet hätte. Die ursprüngliche Fassung hat eine Dauer von fast einer Stunde; ein großer Teil des Celloparts besteht aus weitschweifenden, verzierenden Passagen, doch tun sich hier und dort flüchtige Einblicke in Dvořáks latentes Genie auf, insbesondere in den warmherzigen Themen. The present recording was made on the Marquis de Corberon (Nelsova) Stradivarius of 1726, kindly loaned to me by the Royal Academy of Music.